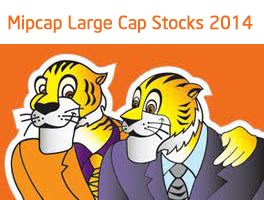 Sharekhan is a leading online brokerage firm has issued report with identification of Best Midcap and largecap stocks for 2014. Each stock identified in this report is leader in its own sectors. Let’s look at Best Midcap and Large cap stock picks for 2014 by ShareKhan. This stock will offer good return and sharekhan team recommend adding this stock in to portfolio on correction. Another stock pick from Sharekhan is from auto sector M&M. Sharekhan says that the tractor segment of M&M contributing about 40% of the revenues & its likely to maintain a double-digit growth in 2014. Automotive volumes are expected to recover in FY2015 on the back of a conducive macro-economic environment. ICICI leading private sector bank of India is also in stock picks 2014. Bank is continuously growing its position by doing active marketing. With significant improvement in the liability profile, the bank is poised to expand its market share especially in the retail segment ICICI Bank is among the well capitalised banks and is better prepared to face asset quality challenges. Leading engineering, manufacturing & infrastructure giant is strong contender of 2014. Strong order inflow guidance indicates healthy revenue visibility; diversified presence, superior execution capability and healthy balance sheet remain its strengths. The ongoing efforts to improve its returns ratios by monetising the long-term development assets are going to be a positive trigger for the stock. HCL technologies is leading IT company and Technology leader. HCL remains a prime beneficiary of the emerging rebid/restructuring IT market, which still poses a $45-50 billion opportunity for the company • The company has a proven track record of winning and executing large restructured deals in the past; it has a very robust order book of over $4 billion which provides robust revenue visibility. Pharma sector has shown bull run in 2013 and many people still believes that it will continue in 2014. Next pick of 2014 by sharekhan is Cadila Health. Jyothy Laboratories is expected to achieve a strong growth of above 20% in revenues and operating profit, driven by the integration of Henkel, the launch and relaunch of products and the rationalisation of the distribution network. The recent repayment of debt through funds raised by preferential allotment to promoters and issuance of non-convertible debentures would result in interest cost savings of Rs45-50 crore at the consolidated level from FY2015; this along with a strong operating performance would result in an exponential growth in the bottom line. Raymond’s restructuring exercise is largely done (in terms of supply chain revamp, cost rationalisation etc) and the benefits are likely to become visible in the results going ahead; thus we expect the branded apparel business to revive its profitability track record. The management’s enhanced focus on the monetisation of its lucrative 120-acre land bank (with its core team in place, the master plan for the real estate business is expected soon). Received approvals recently for developing eleven wells in its key oil fields; it has commenced drilling operations and the early signs from the four wells drilled recently are encouraging which would considerably boost production and earnings over the next couple of years. It remains a debt-free company and its current cash/share is around 25% of its market price. Given the upside potential from the DAS regime and a gradual recovery in advertising, Sun TV’s growth prospects look favourable going ahead.